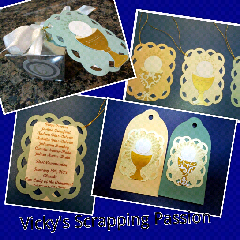 I did this cards and bookmarks for my friends' kids first communion. My gift for the kids (7 in total) were the bookmarks and my gifts for my friends were the cards for their communion's favors. I used my gypsy and the cartridges "New Testament", "Tie the knot", and "CTMH Artise". I used some old cardstock that I had (bassil) and bought some crosses charms for the bookmarks at our local scrapbook store: Stamp Antonio. One of the moms laminated the bookmarks and we added some gold elastic cord to attach the charms. The project was a nice experience and the kids loved their keepsake.